Well, Dave is out of bulk oil. He sold that operation to GM Petroleum of Billings in March. But, he’s hardly “taking it easy,” having resurrected the old Conoco Fastway Gas Station into Engineer's Depot. When we talked in May shortly after the Depot’s opening, Dave remarked, “Lori and I have put in eleven straight days from six in the morning to 11:30 at night. We’ve had a great response - beyond what we expected.” So, Dave is definitely not kicking back these days. talents of Stan Wilting (Wilting Plumbing), Carl Dishong (Tech Electric), and Brother Dean (D. Sorensen Construction) to get the Depot into business and ready for summer traffic. Sorensen purchased the original Fastway in 1979, ran it for 20 years, and then sold it. After being open for another six years in the hands of a different owner, the station was closed and had remained empty for over a year. Dave is now a part owner again. He is happy to have the operation open and providing another business outlet in Harlowton. Dave was born in Billings, but says he’s lived “all of my life in Harlowton.” Not totally true. He spent five years at the University of Montana where he earned a degree in wildlife biology. He then worked for a year in the oil fields near Broadus and returned to Wheatland County to labor on the Milwaukee Railroad as a machine operator for ten years. Before Dave left the Milwaukee, he was an assistant section foreman. Quitting the railroad, he bought the Fastway from Jim Hunter in 1979. Sorensen added a laundromat to the business in 1983 and a liquor outlet in 1991. In the midst of these operations, Dave bought the bulk oil plant around 1984 which was his major preoccupation for many years now. and fish. Sorensen has been civic-minded for many years. He has been on the Golf Board for seven years, had two terms on the Chamber of Commerce Board, and was an officer for many years in the Kiwanis Club. Dave was Distinguished President in 2000 and Distinguished Lieutenant Governor (2001-03) for Division 6 of the Montana Kiwanis. He is retired from the Harlowton Volunteer Fire Department. Dave has two daughters who live in Palm Springs, California. 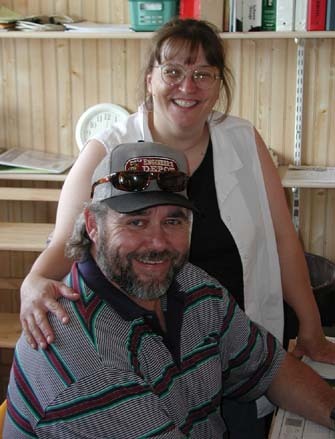 His partner and significant other (now wife), Lori Crouse, in the midst of managing Engineers Depot is also finishing an online degree program in human resources through the Montana State University - Billings. Lori and her two children moved from Alaska to Harlowton in 1992 to be near her mother, Sharelle, and Jack Gehring. Right away, she began to work at the old Fastway, eventually taking over managing the business. Lori’s son, Josh, graduated from HHS in 2003 and attends the University of Montana. He will be going to Kenya on a church mission this summer. Daughter Crystal just graduated from HHS, is working for the summer at the Depot and will be attending MSU-B in the fall. Sorensen is quick to add, “Lori is just as important in this venture as I am.” With Dave and Lori working side by side and engaging the help of seven young employees - mostly high school students, the Engineers Depot is off to a smashing start as the hot summer approaches.